"The Black Ring" - Finale: "Reign of Doomsday"
Superman arrives in Metropolis hot on Doomsday's trail. Lois is there to greet him and informs him that Doomsday had just beaten Steel and vanished in a flash of energy. Superman has a newfound confidence and aims to take down the beast again, he may have died before but this time he is fully prepared. Superboy, regaining consciousness flies around what appears to be an alien ship with perpetual corridors. Instead of finding his kidnapper, Conner is surprised to find Hank Henshaw, Steel, the original Eradicator and his cousin Kara. The Team of Steel bandy around theories as to why they were brought together and how Doomsday is able to replicate all their powers. Of course this is when Doomsday appears and attacks them. Steel can't shake the feeling that the team were deliberately taken to this alien ship so they couldn't interfere with whatever threat Superman is facing. Indeed this is the case. The god of happy thoughts has been overpowered by Lex who has taken on the role himself. Using his newfound powers of cheer, Lex brings his heart's desire to him from Metropolis to deep space. Superman, who is less than pleased to be stolen away from his quest to hunt Doomsday, is shocked to find out Lex was behind Doomsday's reappearance. Even more shocking is that Lex has ripped open the Phantom Zone and taken over a strange power from within the Zone. Before Superman can race into the Phantom Zone portal to rescue his adopted son, Lex pulls him back and tells him all the secrets of his new found status as a god. The happiness god had been the sole living being in the Phantom Zone, basking in its happy thoughts and cheerful life before Jor-El began sending in cruel and evil criminals that began to taint his home. There the god hid until it sensed the dissipating energy of the Black Lanterns. Manipulating them into spheres and sending them out for someone to gather and form into a stargate for him to escape the Zone. Manipulating and goading Mr. Mind, Brainiac, Lois-Bot and Lex into enabling his escape to joy. Lex wants to punish Superman for the years he has suffered and using his empathic powers he manipulates time so Superman re-experiences his death, and now in addition, a flood of emotion from the people that witnessed his fall, including Lois. Torturing Superman further he pulls him back again, this time to the last few seconds of Krypton's life, just so he could witness his biological parent's death. Superman screams in pain as he then has to watch again as his adopted son Chris is swallowed back into the Zone. Then Superman endures the death of New Krypton and Luthor mocks what he interprets as crocodile tears, because and alien hasn't the emotions of a human. With nothing left Superman invites Lex into his mind to experience his heaviest loss, Pa Kent. At first Lex is puzzled and then when he hears Superman whisper to his father the penny drops and the rage within him flares. Far from seeing he and Clark as similar, Lex interprets Clark as a way for Superman to mock him. Lex is determined to break his opponent but Clark points to the time phantoms of he, Ma and Pa, pointing out the Kents made him the man he is today and because of them he will never bow to adversity. Lex cannot understand why even as a god he cannot kill Superman, enter Lois-Bot, now the vessel for Mr. Mind. She explains that the happiness god is suppressing his power from within Lex to prevent him from doing evil. An angry Lex vows to completely overpower his cohabiter and gain full infinite power. Back inside the alien ship a heat vision wielding Doomsday has been outrun by the team. Racing through the endless corridors they theorize that Doomsday can only adapt a single power to deal with a specific opponent. Before they can explore the theory, Henshaw turns on them and a now Eradicator-imitating Doomsday appears. Supergirl punches Doomsday deep into the shadows and the team then turn on Cyborg. Henshaw is cocky and reveals he knows something about the Doomsday attack. Just as before though Doomsday reappears, this time Steel-powered and the combat begins again. The happiness god is dying. He explains he only wanted to spread his cheer, but as a dying wish he would grant Lex infinite power only if he completes his mission to make the universe experience bliss. As Lex becomes omnipotent we see glimpses of all the cameos from The Black Ring. Each and every one of them from Vandal Savage through to Grodd, to Brainiac, to Death herself achieve peace, happiness and good will. Superman is astounded. Lex had made many bold claims about being a better man, curing disease, helping civilization, creating a better world one day, when Superman was gone and with godhood he has achieved what no other god ever could. Lois-Bot hinders the joy, however. She knows that Lex wants to kill Superman, but a condition of Lex's godhood was that he could only continue the happiness god's work. Should he try anything negative, Lex's power would vanish forever. Lex of course cannot contain his dark side and watches as he begins to shrink from gargantuan size, hemorrhages Black Spheres and his Zone energy begins to fade. The more Lex was ruled by his emotions the more power he loses and Superman begins to goad his enemy to quicken to process. Zipping back into the ship we stand with the heroes as Cyborg leads them to a laboratory he has discovered. The sight they see shocks them and simultaneously outside Superman's verbal jibes and physical jabs erase the last vestiges of god power from Lex. With the loss of power comes a final gift from the happiness god - a purge of Lex's memory of Clark's identity. The victory is short lived as Lex teleports away with his battle suit tech, but not before revealing his secondary mission: Trapping the Team of Steel on the other side of the moon in the space where New Krypton once was as bait. Superman watches Lois-Bot, now free of Mr. Mind, fly off into space to be alone, and then boards Lex's ship heading to the New Krypton gravesite. As he races off he doesn't see a small fetus of the happiness god float away vanishing into the darkness. When Superman finally arrives there is nothing to see so he scans the area and sees that Steel had left him a trail of breadcrumbs to follow. Nanobytes that lead into what is revealed to be an invisible ship! Scanning the ship further Superman discovers the trick that Luthor used to make the ship an infinite corridor prison and he bypasses it. He may have created a way to escape but his main priority is his friends and meeting up with them inside he is relieved to discover they are all alive. Henshaw however reveals to Superman what he had found - the corpse of the original Doomsday. The body hooked up to hundreds of cables and tubing it couldn't possibly have attacked them all, it was definitely killed when the New Kryptonians had dealt with it. It seems Lex had been experimenting with Doomsday when he was in Project 7734. Cyborg grins as the penny drops on the team and out of the shadows the secret is revealed. There wasn't just ONE Doomsday adapting to them all. There were THREE clones and the Reign of Doomsdays is about to begin! Story - 2: Two mishandled mashed stories forced together because it's an event issue and some of the worst plot devices ever are thrown in. A happiness god? Lex discovering Superman is Clark and then developing amnesia. The endless, endless, endless, elaborating and theorizing. Perhaps most shocking of all, Lex is revealed to be behind Doomsday's return but this more interesting story was made the back-up so Lex could find Black Spheres? The pointless monthly cameos we endured were all revealed to be as we thought - pointless. Henshaw's desire to die in the JLA chapter was replaced by mustache twitching villainy. Supergirl went all Neanderthal. Eradicator became mute. The only plus sides were that this was finally the end of the story and the character moments between Lex and Clark, even though that was negated almost immediately by terrible hokey plot devices. A timeline from DC would be handy, Black Ring took place simultaneously to Grounded. Black Ring is now over but it took place before Reign of Doomsday. Reign of Doomsday happened during Grounded. The Kid Flash/Superboy race took place during Grounded, because Flash and Superman watch it live on TV. The day after the race Superboy is abducted by Doomsday. Grounded is still to reach the end. If the writers and editors can't keep things in chronological order how are we supposed to follow it? Art - 3: The art is as much a mess as the writing though not quite as awful. The problem is there is no fluidity, because every two or three pages we switch to a new art team, it's just a jarring experience to read. No single artist was able to make the story their own. Jor-El hires a young newlywed and parent to devise a life support and food storage system for a small rocket. The hitch is it must be done in three days and though the brilliant young man can help save one life for his new employer he struggles when realizing he and his new family, not to mention everyone else around him will die in three days. He agrees to help but only if Jor-El allows him to say goodbye to his wife and daughter. Story - 5: A heart wrenching story that explores the state of mind Jor-El was in before his death and offering something new by showing the fleeting life of another new father who sacrifices his family for Jor-El, whom before this story, would have had his sacrifice lost to us. Art - 5: Beautifully rendered art, beautifully inked and beautifully colored. Easily the best story in this book! Superman is talking to Sarva, a gentle but powerful being. Sarva explains his past, that he had settled on the planet they are enjoying the holographic representation of. On this planet in return for its inhabitant's hospitality Sarva used his abilities to quell the Planet's natural disasters but one day it suffered the same fate as Krypton. Unlike Jor-El's rescue of his son, Sarva thought it best not to relocate the I'awa tribe to a new planet where they would have to struggle to survive. Years later Sarva ended being the last survivor of his race and that is when he met a superman for the first time. His new friend had also a handful of I'awa survivors and offered them a home in his interplanetary zoo. Upon telling his tale Sarva realizes he is a last son also. Was he wrong not to rescue the I'awa? Superman smiles gently and points out they aren't gods, they are only human. Story - 3: An odd little story that tries to draw parallels between Superman's origin by drawing a comparison to Sarva's own. Despite the unique approach it's a story that does make you question the motives of Jor-El and even Kal's. I wish I had read more of Sarva's stories to connect with him but the human sensibilities are brilliantly explored and I hope to see a bit more of him someday. Art - 4: A wonderful alien environment and busy detail-filled panels make the story one you really focus on to see everything that's going on. A special mention to Java Tartaglia whose ghostly coloring made the art really come to life and gave Sarva a ghostly glow. "Friday Night in the 21st Century"
Lois is rifling through her desk at the Daily Planet watched by a bemused Clark. Lois reveals that Saturn Girl has given her a Legion flight ring in case of emergencies. Curiosity piqued, Clark questions what his wife will do with it. To his surprise she invites his Legion buddies over for a party night so he can enjoy some much needed downtime. Story - 3: A nice little glimpse into Lois and Clark's life. Bizarrely not since Lois & Clark the TV show have we actually seen the couple enjoy some actual time as a married couple. It's short and sweet but leaves you desperately wanting more. Art - 4: As above it leaves you desperately wanting more! Superman arrives to meet Gabriel Wright, the President's National Security advisor. Pleasantries do not last as Superman senses he is marked for death. Snipers armed with kryptonite ammunition ready to drop him... a harsh welcome from America, especially after all the good he has done since arriving in Metropolis many years ago. Bottom line, Wright informs him that America views him as having gone rogue. If that's the case they won't hesitate, but they wait for answers, why did he go to Tehran? Superman informs him that like most people he had witnessed the coverage of a large demonstration there. Though it was a peaceful demonstration the Iranian army had been monitoring them and were ready with excessive force to issue 'harsh repercussions' for organizing such a gathering. Despite the warnings these were common people, men, women, children willing to risk harm to ensure their voices were heard. It was an act of civil disobedience, and resistance to oppression. So impassioned were the people that Superman felt he should show his solidarity with the average man. His mere appearance inspired the populace to stand at his side and resist fear and he lifted not one finger or used one power. He just stood there on the spot for 24 hours and was joined by 1 million people who now found strength to stand up for their rights. At the end of the 24 hour period Superman and the civilians dispersed peacefully. Superman's freedom of will immediately angered both Iran and America. Both viewing him as America's property whose presence declared an act of war. The dressing down from Wright falls on deaf ears, Superman is fed up of being an instrument of American policy, he was brought up an American but he isn't a possession. He is on his way to the UN to seek an international identity so as to avoid further meetings like this one. As he walks away Superman reveals the outcome of the protest. It was so one man could deliver a symbol of peace, a rose, to one of the soldiers. An unexpected brave act that inspired him to also stand up for himself. "This short story is just that, it will not be followed up upon. Superman will remain as American as Apple pie." It's a shame, DC for one day at least had guts, just like Superman did here. Art - 4: The art was solid and illustrated the story well without the need for big abrasive showboating splashes. For that I'm grateful as it gave the story a life and room to breathe. I should draw attention to the artist's interest in exploring how to illustrate Superman's powers. The microscopic scans and the x-ray and infrared vision depictions show a real flair for creativity, seeing things from Superman's own eyes is rarely done. Cliff Carter is in the newsroom of the Daily Planet to denounce connections with Intergang. Carter is a former sports star who is now working with SuperTech, a company itself that has been accused of stealing ideas from STAR Labs. His arrogance irks Clark but strangely enamors Lois, which of course makes Clark intensely jealous. When Carter reveals he is wearing the EX9000, a suit that uses ambient electricity to give its wearer Superman level powers, it does not help matters. Worse still the arrogant visitor enjoys showing off so much he openly challenges Superman to a race. Lois shrugs that Superman wouldn't do such a thing but is surprised when Clark stands up and agrees to arrange it. The race indeed does happen and last to do a circuit through Metropolis and touch the Daily Planet globe would lose. The race starts off well and initially things are in good, sportsman conduct but Carter is intent to better the Man of Steel and ups his suit's power levels so he can snub Clark. He tugs on Superman's cape and uses the momentum to spurt forward in the race. But disasters begin happening, Carter's suit begins to draw power ambiently from all kinds of sources. Billboard lights dim, buildings lose power and the train system's automated computers go offline while Carter is draining them to power himself. Carter ignores the emergencies, intent on winning but Clark can't look the other way and halts the train from a fatal crash. Superman begs Carter to stop, as they are passing Strykers Island, home to hundreds of Super criminals. Pouring on the speed he pulls Carter away just in time and vows to shut him down. Drawing the showman to the hydroelectric dam he forces the suit to channel too much electricity and in doing so blows it, like a fuse. Lois arrives as Clark quick changes into his civilian clothes. She knows Cliff was a threat and is happy he is alive and the suit is beyond repair but berates her husband for bowing to jealousy. Clark shrugs and smiles that he is only human. Story - 3: A nice soft, non-harmful story that entertains without pushing too hard. It's nice to explore the relationship between Lois and Clark, again something the books have foolishly missed for years. Also it was nice to see Superman acting just like us and not two dimensionally. The form of a script makes sense given Donner's background and makes a nice change to the comic form. Art - 3: I can't shake the feeling that these nice illustrations would have been even more enjoyable had they been fully rendered as a comic. Especially given the fact most of the story explores Metropolis locations, still they do the job and in the style of a film storyboard and in that respect the art succeeds. 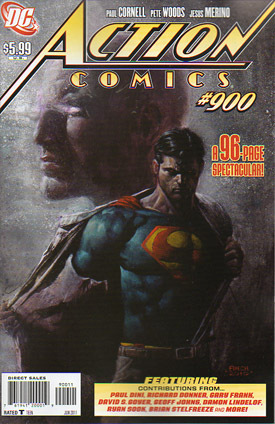 Cover Art - 2: A moody Lex and an even moodier Superman. A nice image for The Black Ring or Grounded as a collected edition but as the cover of a Superman milestone it's honestly a bit on the bland side. 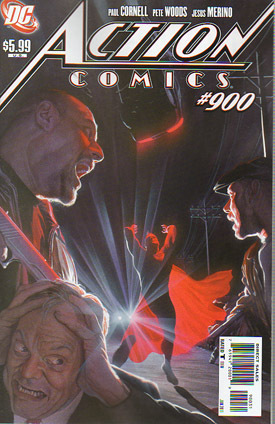 Cover Art (Alex Ross Variant) - 2: Perhaps I'm desensitized to Alex Ross' cover as his work has become so commonplace it has lost its unique sparkle. This re-imagining of Action Comics #1 is cool enough but it just doesn't seem to have the same feel as say a cover to Kingdom Come or Justice once had. Cover Art (Adam Hughes Variant) - 5: This cover is stunning. 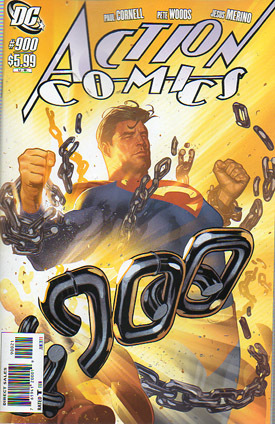 The chain links forming 900 is inspired and creative. The chained hero pose has been done to death but here it feels fresh, inspiring and most�importantly - meaningful.